Giving is a principle that is taught throughout the entire Bible. When we give, we express worship in a tangible way by putting God first in our lives, all while allowing us to be a part of the most important work in life that is spreading the Good News of Jesus Christ! Your generosity enables us to help people grow in their relationship with Christ by helping them discover how to cooperate with the Holy Spirit in whatever ministry they may have. That helps us fulfill our part in the advancing the Kingdom of God worldwide. You can designate to a particular fund as well. Please have account details on hand. With the stock market at record highs, gifting stock may be a wise move for you to consider. You will receive a tax deduction for the fair market value of the gifted securities and eliminate paying capital gains tax. This is a great way for you to make your stewardship go further. 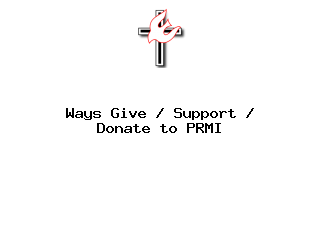 For donors in the USA, your gift to PRMI is tax deductible to the extent allowed by the IRS. We will issue a tax receipt for your donation. We invite you to join our monthly automated giving program, Sustaining the Flame. When you signup for Sustaining the Flame, monthly gifts will automatically be sent to PRMI via your choice of payment (debit / credit card). Yes. We are a 501(c)3 tax-exempt organization and your donation is tax-deductible within the guidelines of U.S. law. To claim a donation as a deduction on your U.S. taxes, please keep your email donation receipt as your official record. We'll send it to you upon successful completion of your donation. We will also send you a paper receipt by US Mail, as well as a year end giving statement. Can I give direct from my bank or by check? Yes, Please call Suzi at (828) 669-7373, to set up a secure, automatic, no-cost withdrawal from your account. Or mail a check to PRMI, PO Box 429, Black Mountain, NC 28711-0429 for secure delivery. What about donations other than cash? Most of us have limited available cash, but a gift from an insurance policy, will, bequest, or stock is a perfect way to truly bless the ministry without affecting your current standard of living. Contact Jeanne at(828) 669-7373, for more information and no obligation. Bless you! A donation receipt will be sent to you at the email address you provide on this form. Please be sure to keep a copy of your receipt for tax purposes. If you select a recurring donation, you will be sent an individual receipt each month when your donation is processed. You will also receive a paper receipt and a year end statement. Please call Suzi at (828) 669-7373, to update your address or to get information about your giving history to PRMI through events, online and mail donations. How long will it take to receive a receipt for my donation? Online donations will be receipted immediately to the email address provided. Within 30 days, you'll receive a paper receipt (or PDF by email), and in January, you'll receive a year end summary for the prior year. What if my online gift fails? Sometimes, automaed security checks on your credit/debit card leads prevents a successful transaction. Yes, Please call Suzi at (828) 669-7373, to set up a secure, automatic, no-cost withdrawal from your account. Or mail a check to PRMI, PO Box 429, Black Mountain, NC 28711-0429 for secure delivery. If it seems to be a bug in the software, file a bug report here. Can I make recurring donations? Yes. Our recurring donation program is called Sustaining the Flame. Choose monthly in the payment form. Quartely and semi-annual automated payments are possible. As a person with no ministry background, but still longing to serve my Lord, Walking with the Spirit was very positive. While there is still wrestling with things, I feel that my relationship has become closer than ever before. It was reassuring and eye opening to how the Holy Spirit is within us and at times upon us for empowering to accomplish something for the kingdom of God. This event was an answered prayer in many ways for me and my walk with the Holy Spirit. I was surprised at the depth of friendship that emerged in such a short time. Some deep issues in my life came up that were effectively addressed so that I left refreshed and encouraged. Several questions that I came in with grew more complex by the time that I left so I am challenged to continue learning. The most inspiring part of the event could have been just observing the unity and kindness of the leadership team. You could see Jesus in them!